It’s been announced that Rage 2 will have a new trailer debuting at The Game Awards this Thursday, December 6. Unfortunately, we don’t know what to expect from this new trailer yet – more gameplay, new weapons, or how about more of an insight into the major characters and story? We’ll have to wait until Thursday to find out. Darn. 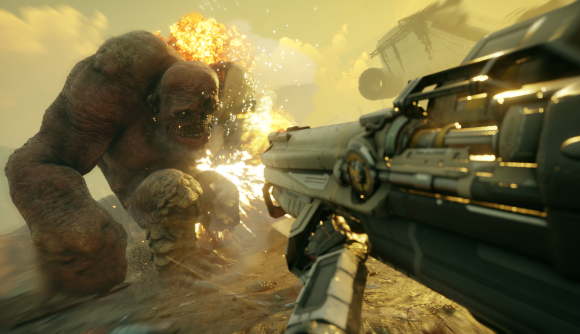 The first trailer for Rage 2 was released back in May this year and revealed that Avalanche Studios would be making it alongside the developer of the first game, id Software. We got plenty more info about the game during E3 2018 including its mix of vehicular combat and gunplay, that it will have no loot boxes, no multiplayer, and Andrew WK is involved. Hopefully we’ll find out much more about the game with this new trailer. There’s a small tease of what to expect courtesy of the Rage 2 Twitter account, where the news was announced. You’ll notice in the tweet that the developer seems a little upset about not getting any award nominations for Rage 2 – probably because it isn’t out until 2019 – and jokingly creates a category for Rage 2 to enter and win – the ‘Best Post-Post Apocalyptic Western’. This isn’t the only news about the lineup for The Game Awards we have. We previously found out that we’re to expect more than ten new game announcements during the show on Thursday. We also found out today that CD Projekt Red won’t be attending The Game Awards so don’t expect to see any new Cyberpunk 2077 gameplay footage. Oh, and it’s probably worth noting that the news of this Rage 2 trailer arrives on the same day as the Just Cause 4 review embargo – one of the other games Avalanche Studios has been working on recently. Our own Just Cause 4 review is right there so give it a read – spoiler: we like it, but wanted it to be a little more original.